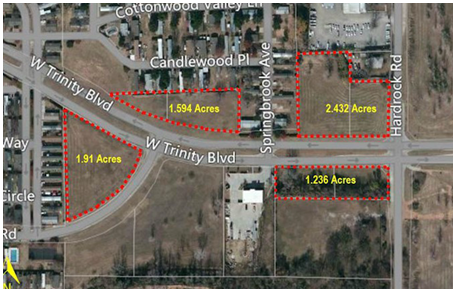 ​​​ GRAND PRAIRIE – Riveridge Properties sold more than seven acres it acquired in 1993 to Elmore Enterprises. The detached tracts, zoned for light industrial and ranging from 1.2 to 2.4 acres, are located on West Trinity Blvd. in Grand Prairie, near the well-traveled President George Bush Turnpike. ​Want more​ data? See DFW Market Overview Research.